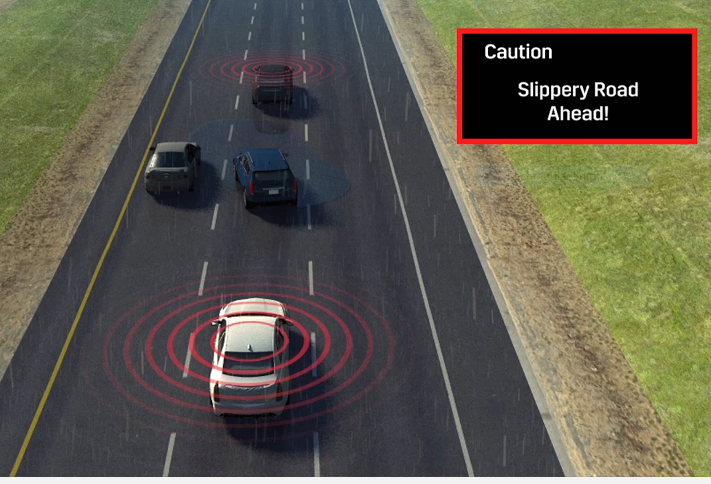 V2V technology can warn drivers of many dangerous situations. Despite being the first automaker to put vehicle to vehicle technology in a car in the U.S., it appears General Motors is not yet ready to match Toyota's April announcement that it will voluntarily put the life-saving technology in most of its vehicles by the mid 2020s. V2V allows cars to communicate with each other and with infrastructure like traffic lights. It can prevent many types of accidents, for example, by warning drivers they're about to plow into the back of another vehicle, or warning that another driver is about to run a red light, giving a driver time to take action to avoid the collision. V2V can also warn drivers about blind spot dangers, vehicles coming to a sudden stop several cars ahead, and many other common scenarios that result in accidents. When fully implemented, V2V could also protect pedestrians and bicyclists, who could put a V2V app on their phone, to make sure drivers are aware of their location and path. Experts say V2V could prevent or mitigate up to 80% of the accidents involving non-impaired drivers. But the technology will be of limited use unless all automakers install it, in all their cars, and unless states install V2V into the road infrastructure, including traffic lights, stop signs, blind curves and the like. Both the Obama and Trump administrations have delayed issuing a federal mandate requiring V2V, although proponents say the technology is not that expensive, and is ready to deploy sooner rather than later. You can learn more about V2V here.